Londres : H. Baillière, 1868 (2nd rev. ed.). Description : -44 p., [3 l.] pl. ; ill.: 1 phot., 2 (fold.) engr. ; 23 cm. Photograph : 1 frontispiece, albumen mounted to board. Subject : Physical body — Trauma ; Transport of wounded ; Military medicine. Author caption: Par le Dr H. Vercamer, Médecin de bataillon de 1re classe au régiment des Grenadiers, Ex-médecin de régiment du Corps Belge expéditionnaire du Mexique, Officier de l'ordre de la Guadeloupe, etc. Medical studies(incomplete), l'hôpital de Gand, 1855. Entered military service as a physician, 1858. Promoted to the rank of major (Ordre de la Guadeloupe), 1865. Title note: Extrait des Archives médicales belges. Deuxième édition, revue et augmentée d'une planche photographique. Subject of the photograph is an artist's sketch of an ambulance. Only the offprint edition has the photograph. Inscribed: Monsieur Dr. [Léopold-Joseph-Benoit] Delhaye. Hommage à l'auteur. Dr. Vercamer. Louvain, 19 Xeme, 1868. Scarce, 5 copies located in Worldcat. Index Medicus: 11506771110, 11606391310 (journal). The only work published by this Belgium military physician who acquired the greater part of his informal education upon the battlefield. The first edition appeared as a paper in Archives médicales belges. 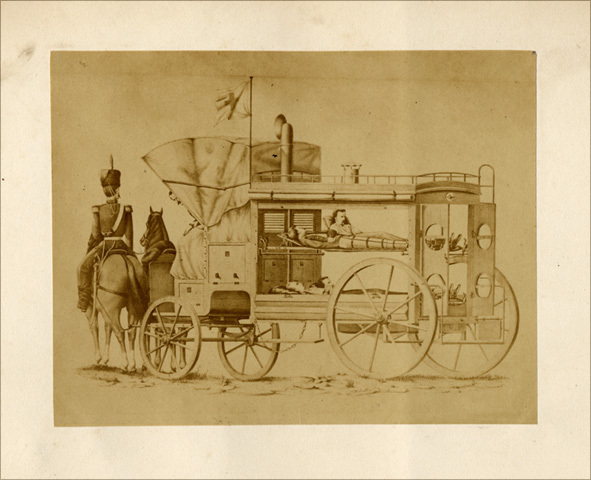 The second edition offprint, revised and enlarged, is extra-illustrated by a photograph reproduction of a pen and ink wash drawing representing Vercamer's ambulance. The paper provides, in exquisite detail, what Vercamer believed were the best design concepts in a military conveyance for combat wounded. He includes notes and critiques of the most advanced ambulances built by other nations and displayed in competition at the Exposition Universelle, held on the military parade grounds of Paris (Champ-de-Mars) in 1867. Vercamer was especially impressed by the American entry, constructed in Paris under the supervision of Dr. [Thomas Wiltberger] Evans (1823–1897), and featuring detachable litters slung from rubber ring shock absorbers.